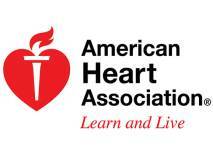 The American Heart Association (AHA) strongly advocates that automated external defibrillators (AEDs) be placed in targeted public areas, such as gated communities, office complexes, sports arenas, gymnasiums, shopping malls, and other public and private places. An efficient PAD program is able to achieve a 3-minute response time from the collapse of a patient to the arrival of a AED with a trained rescuer. This 3-minute guideline is very important as it can save lives. The American Heart Association notes that for every minute defibrillation is delayed, the chance for survival decreases by about 10 percent. Defibrillation within three minutes of a sudden cardiac arrest increases the chances of survival to 70 percent; within one minute, the chances for survival increases to 90 percent. The amount and the placement of AEDs can also be determined by analyzing historical data. Identifying locations at which the incidence of cardiac arrest is higher than normal can be used to place AEDs in sites where the incidence may be elevated (such as corporate gyms or cafeterias). The AHA advises property owners and managers to carefully consider the historical data when placing AEDs for maximum efficiency and coverage. It is vital when placing AEDs to identify areas with large numbers of individuals – employees, visitors, guests, etc. Though research is lacking showing a correlation between high volume areas and increased chances of cardiac arrest events, common sense indicates that with more people comes a greater risk for sudden cardiac arrest. Common sense would also indicate that individuals in areas of high-risk activity are more likely to experience sudden cardiac events. An exercise facility is one such high-risk location, especially one that caters to older individuals. Determining locations with high-risk activity will figure into the determination of where and how many AEDs to place on a property. The AHA wants to make AEDs as accessible as possible; the more AEDs in a community, the more lives will be saved. Using the 3-minute response time as a guideline, and considering incidence rate and high-risk locations can ensure an efficient PAD program and the ideal amount of AEDs at every location.